Dr V.Shanta was born in a distinguished scientific family of India in Chennai. Her immediate grand uncle and uncle were both Noble Laureates. She graduated (M.B.B.S.) in 1949, D.G.O. in 1952 and M.D, in Obstetrics & Gynecology in 1955. In April 1955, she joined the fledgling Cancer Institute, established in 1954 by the Womens' Indian Association Cancer Relief Fund, as its Resident Medical Officer in preference to the Asst. Surgeon's Post in the Women & Children's Hospital, Madras, to which she had been selected by the Madras Public Service Commission. Dr V.Shanta is at present Chairman & Executive Chairman of the Cancer Institute (WIA) Chennai. Her entire medical life over 50 years has been dedicated to the mission of organising care of Cancer patients, the study of the disease, its prevention and control, the generation of specialists and scientists in different aspects of Oncologic Sciences. 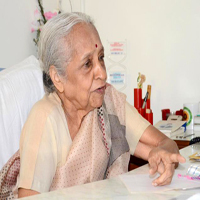 She has played an important role along with Dr. Krishnamurthi in the development of the Cancer Institute (WIA) from a cottage hospital of 12 beds to a major comprehensive Cancer Centre of national and international stature. She has played a pioneering role in all the achievements of the Institute. She was on WHO Advisory Committee on Cancer till March 2005. She was also Convener of the State Advisory Board on Cancer. She has been Chairman of the INDO-US Collaborative Group on Lymphoid Neoplasias (Indian Chapter), member of many ICMR Committees, member of the ICMR Task Force on Registries and member of the Syndicate of the Anna University. She was President of the Indian Society of Oncology (88-90), President of the Asian & Pacific Federation of Organisations for cancer control (97-99) and President of the 15th Asian & Pacific Cancer Conference (1999). She has participated in a number of Scientific International Collaborative Programmes. Apart from many awards from public and official organisations for her contribution to the advances in management and control of Cancer, she was the recipient of major National and International Awards. She has published over 95 papers in national and international journals, contributed chapters in Oncology books, delivered many prestigious orations and participated in many international and national conferences. 1997 IARC Award - Work for Development of Registries in India.